If you’ve ever felt the warmth of a heated floor on a cold, rainy Seattle day, then you know it makes a big difference in your comfort level. There are few people who wouldn’t appreciate the added warmth in their home during cooler months, especially when they learn that heated floors are relatively energy-efficient. If you’re considering a new home, the cost of adding in-floor heating to a single-room remodel is a relatively inexpensive upgrade, given the immense satisfaction that comes along with it. Heated floors are known in the building industry as “radiant floor heating” or “underfloor heating.” They work by transferring heat through the floors using electrical cables or tubes of hot water (called hydronic floor heating). 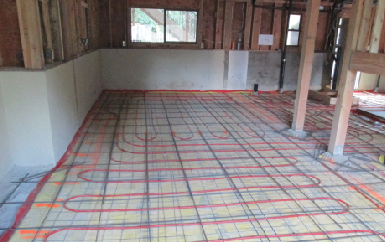 Floor heating is typically installed on top of the underlayment (electrical) or just below the subfloor (hydronic), in a precise pattern that ensures every inch and corner has an even heat distribution. The temperature can then be controlled via a programmable thermostat on the wall. You can choose to heat your entire home with radiant floor heating, or just use it for supplemental heating in one or two rooms. For most homeowners, we recommend the latter. The most common rooms to install them in are bathrooms, mudrooms and basements. Tile or concrete are often the natural choice for these locations because they are easy to clean, but those materials feel cool to the touch. To combat the cool, especially in rooms where you walk with bare feet, heating is a simple solution. Thankfully, both tile and concrete hold heat better and withstand higher temperatures than other flooring materials, making them the perfect match for radiant heating. They will retain the heat even after the system is turned off, thereby using less energy than, say, a space heater, to heat the room longer. Electric floor heating is reasonably energy-efficient, and close to negligible if you’re already powering your house with solar. Electric systems are the most common and affordable choice for small spaces or single-room applications. They are great for remodels because they are thin, adding little height to the floor. Heating cables are snaked across the floor in a patterned channel or using pre-manufactured mats, depending on the customization required. The tile installer or flooring specialist will be able to install the heating system, but you should plan for the additional cost of a certified electrician to hook it up to your power supply. When all is said and done, adding floor heating to a small bathroom can cost as little as $1,500. It’s a relatively minor investment when you consider that the overall cost of a bathroom remodel in Seattle can be upwards of $50,000. Hydronic systems are recommended for larger applications — such as an entire house or a full basement — due to the lower operational costs. Larger systems could initially cost well over $50,000 but are very energy-efficient over their lifetime. These systems are most often installed during initial construction or major remodels because they are installed deeper in the floor and require more height for the tubing. At the end of the day, heated floors are a preference, but one worth indulging if you have the means. If you tend to run cold, the simple joy of warm feet straight out of the shower is worth the relatively low cost. Ask your contractor about your options. For a feature you’ll use daily for most of the year, this seemingly small luxury goes a long way. 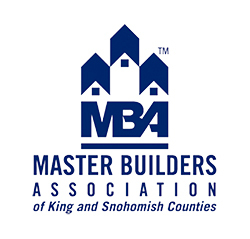 Jason Legat is the founder and president of Model Remodel and is a member of the Master Builders Association of King and Snohomish Counties (MBAKS).